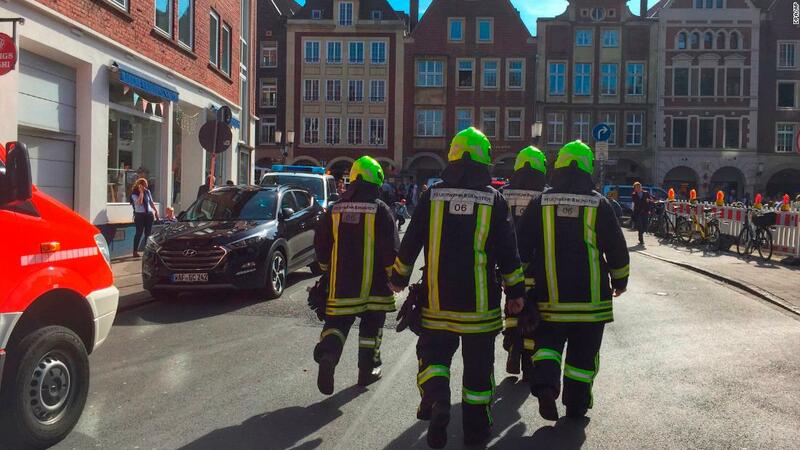 (CNN) A delivery vehicle slammed into a crowd Saturday in an apparently deliberate attack in the German city of Muenster, killing three people and leaving 20 others injured, police said. The vehicle drove into a restaurant's open terrace around 3:30 p.m. local time, according to police spokeswoman Vanessa Arlt. Ulrike Demmer, a spokeswoman for the German government, called news of the attack "horrible" on Twitter. "Our thoughts are with the victims and their loved ones," she said. Firefighters walk through downtown Muenster, Germany, on Saturday after a vehicle drove into a crowd. "With dismay, I learned of the terrible incident in Muenster," Interior Minister Horst Seehofer said in a statement, adding, "Police in Muenster and throughout (the federal state of North Rhine-Westphalia) are now working hard to investigate the matter." Federal authorities are in "close contact" with local authorities, Seehofer said. Saturday's crash occurred on the one-year anniversary of a similar attack in Stockholm, Sweden, when a stolen beer struck pedestrians, killing five people.